In the winter of 1943, with America fighting a worldwide war, concerned citizens, civic organizations, and religious congregations throughout the U.S. were busy on the home front offering service men and women whatever support they could. 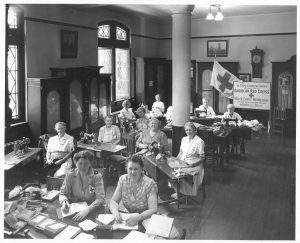 Be it knitting socks and sweaters for an ever-expanding enlistment pool, staging community scrap drives, staffing USO and Red Cross stations, or writing V-letters from home, average Americans reached across the street and around the globe in a unified effort to help bring the war to an end. 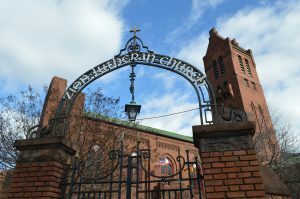 Zion Church of Baltimore – like so many other houses of worship – added a special spiritual element to its important earthly endeavors. One component of those endeavors has reemerged in the way of a vintage 78 r.p.m. record which was recently donated to the church. Pastor Fritz Otto Evers served the congregation of Zion Church of Baltimore from 1929-1952. Titled Christmas Greeting From Home, the single-sided RCA record was distributed to church members who were then serving in the armed forces. Running about 3 minutes and 30 seconds in length, then-Pastor Fritz Otto Evers, along with the Zion Church choir, may be heard on the scratchy 78 offering uplifting words of faith, hope, and love. And though the existence of Christmas Greeting From Home has been known to present-day parishioners for some time, the vintage copy may have traveled with its owner to the South Pacific. Hans George Walz was the original recipient of the Walz family copy of the Christmas message. Walz, a Baltimore Polytechnic Institute alumni, joined the Navy shortly after his graduation in 1943. After serving his country in the South Pacific, Walz returned to Baltimore, where he raised a family and spent his working life in the lumber and manufacturing businesses. Walz passed away in 2005. 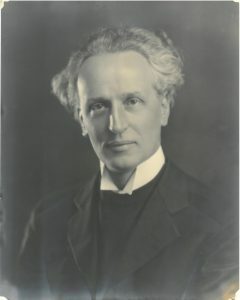 Evers was Pastor at Zion Church from 1929 – 1952. Those who remember him describe Evers as a handsome man with a sometimes difficult to understand German accent. Evers passed away in 1963 and is interred at Lorraine Park Cemetery. The fact that Evers spoke with a strong German accent is important to the story, not only when one listens to the recording, but when one considers the time and the place in which the message was given. 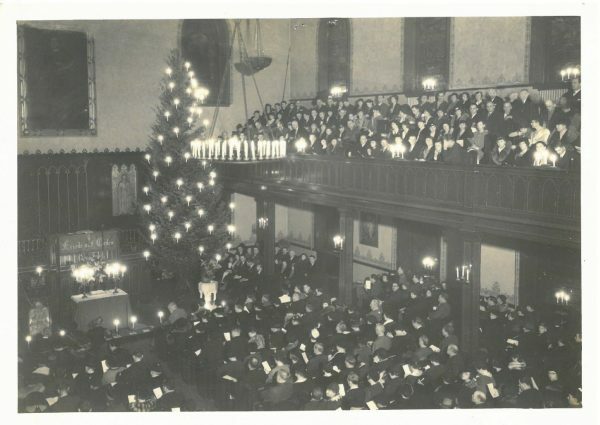 The church history continues: “At the home front, the congregation concentrated on the war effort. 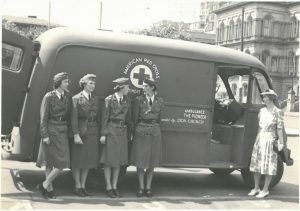 Unforgotten is the day in May 1942, when Pastor Fritz O. Evers on behalf of Zion Church committed the ambulance ‘The Pioneer’ to the hands of the American Red Cross… The gift was accompanied by a considerable check for the purchase of blankets. 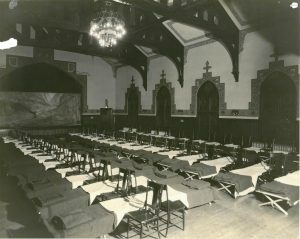 As during the First World War, the Parish House was again opened to servicemen on furlough, on all weekends, for lodging and a breakfast on Sunday morning. More than 15,000 men were accommodated from 1942 until 1945. Mark Duerr – another longtime member of Zion – became fascinated with the recording some years ago, after finding a pristine copy in the back of a church office desk. “I was cleaning out the desk and reached way into the back of a drawer when I felt the heavy paper sleeve. It may have been there for decades – who knows? The copy I have in my possession is a much cleaner copy than the one the Walz family donated, but then the Walz copy literally went through the war. I had a professional engineer send me an MP3 of my copy. To tell you the truth, it’s not a great recording and can be very difficult to understand. I find when you turn the treble up and the base way down, it’s a little easier to get what Pastor Evers is saying. “Still, I think it’s pretty amazing that this recording exists. Duerr said other copies of the recording are known to exist, but to the best of his knowledge, no one knows how many of the records were made, or if they were sent overseas as V-Mail or remained stateside. “It would be hard to nail down specifics because most, if not all of the people from that era, are dead,” said Duerr. The tee-shirt was a souvenir which belonged to my father, Larry Hayes, who had taken his basic training at Sampson in the 1950s. I rescued it one day from the mothballs of his old footlocker and wore the shirt until I finally wore it out. 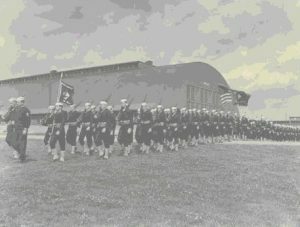 Sailors on the drill field of Sampson Naval Training Station. But Walz was in the Navy. Why would he have been at Sampson, NY in 1943? My father explained the seeming contradiction. Dad recalled the base as antiquated and a miserable place for young servicemen. If Sampson was as woeful a place in 1943, as it was more than a decade later when my father took his basic training there, then that could well explain why Walz held onto the heartfelt “Christmas Greeting From Home” for the rest of his life. As for the question of how many records were distributed and where did they go, it might be apt to consider that more than 411,000 recruits were trained at Sampson during WWII. Who knows how many had a chance to hear Walz’s copy that Christmas, or could have listened to it as the earnest Baltimorean served his country in the South Pacific for the remainder of the war? 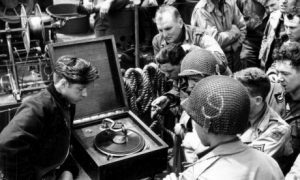 American servicemen listening to a phonographic message somewhere in the field during World War II. “Every Sunday you sang this in Sunday School and Church. “The great story of Christmas, and the birth of the Savior, is easily familiar to you. Your faith may have wavered as you grew up and had to face the most serious aspects of life. But today, you are once more united with us in one faith and one brotherhood. The Father in heaven gave us his Son, that we might have everlasting life. “We at home here hold you in our dearest thoughts and our dearest prayers. We long for you, as you long for home in these days. Yet, we know you will be in our Heavenly Father’s keeping. “Wherever you are, there He is also. “May He be your guide and your strength. “May He give you courage and fill your soul with a firm will to give your best at all times. “May He bring you home to us, unharmed and full in body. “May He speed the day when His peace shall reign over all the earth. “A blessed Christmas to you, our boys and girls, from old Zion.